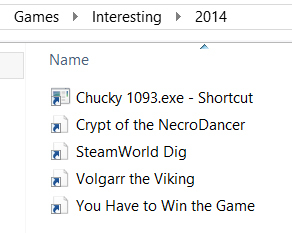 Every year I put PC games that were fun and/or interesting into a special folder. 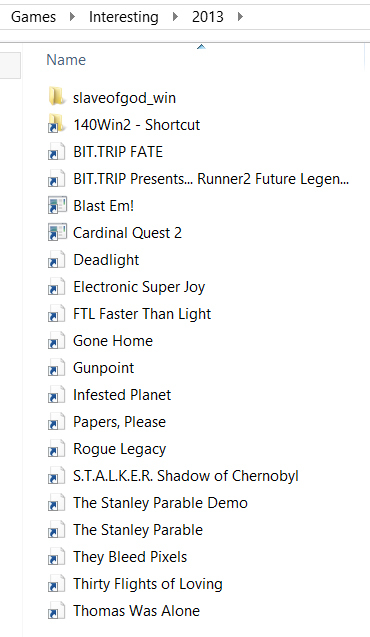 Most of then are indie games but an occasional AAA game creeps in sometimes. The games weren’t necessarily new that year but that was just when I happened to play them. Anyway, here are my lists from 2013-2016. Do you remember playing some of these? My favourite game was FTL. I got super-addicted to it and managed to beat it eventually. Steamworld Dig is a fantastic game and the newer Steamworld Dig 2 is even better. Also Crypt of the Necrodancer was great. Darkest Dungeon was fantastic, and hard, and it made an impression on me. Shovel Knight was also really great, and so were many of the other games I played that year. Legend of Grimrock 2 was my favourite. I’ve been a fan of Dungeon Master style games ever since the Amiga. I didn’t play many desktop indie games in 2017 because I was so focused on finishing and shipping Shadowhand. I played some on console when I took a break from the PC, but they aren’t listed here. Anyway, these are the ones I found most interesting (in no particular order). Note that they may be older than 2017 but I didn’t get round to playing them until 2017. It’s an RPG game that starts off like an old-skool game and gradually evolves into a more modern style game. I thought it was pretty neat. A smart rogue-lite puzzle game with decent pixel art and a certain charm. It’s quite tricky! A neat RPG where you build the dungeon by laying down cards for rooms, monsters and loot etc. Everyone was talking about this so I thought I’d better try it and guess what? It was good. Metroidvania style gameplay and very polished art. I can’t remember how I ended up with this game but I’m a sucker for old-skool pixel art experiences (if done well). So I probably saw this on Steam and got it, and it was good. I got to play an alpha of this and it was so addictive I had to delete it otherwise I knew it would delay my work on Shadowhand. Recommended! 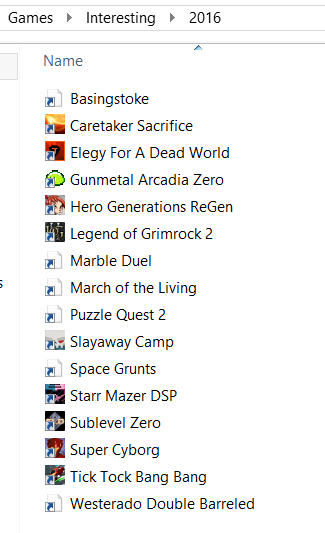 I played a lot of card games the last couple of years as research for Shadowhad. This one wasn’t useful as it didn’t give me any ideas, but it was a clever idea, so it made my list. Yes I know, late to the party, but I liked it a lot. This is the only game on the list that I beat because I have a compulsion to beat level-based FPS games. You are currently browsing the archives for the Game Recommendations category.